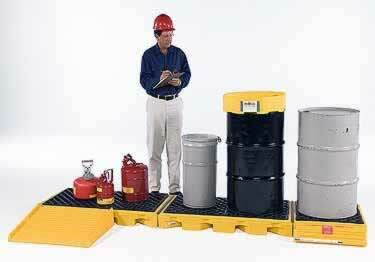 Low Profile, Modular Spill Decks Allow You To Design And Create A Spill Containment System That Meets Your Specific Needs. Spill Decks are available in 1, 2 and 4-drum modules. Modules are easily connected together with bulkhead fittings to allow a virtually unlimited number of customized configurations. The bulkhead fittings not only "lock" connected modules together, but allow spilled liquid to flow from one module to the next. Low Profile, Modular Spill Decks Allow You To Design And Create A Spill Containment System. Available in 2 designs and 4 colors, finally a door handle protector that will offer the protection your door needs.